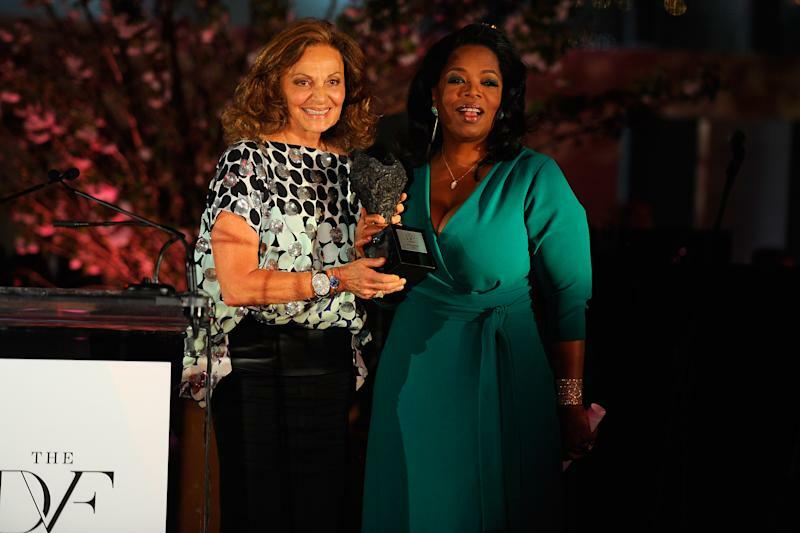 NEW YORK (AP) — Oprah Winfrey was embraced in a hug by longtime friend Diane von Furstenberg as she took to the stage to accept a "Lifetime Leadership" honor at the third annual DVF awards. "She is the most formidable person I have ever met in my life," the designer and humanitarian said of Winfrey at the event, held Friday night at the United Nations. "What is extraordinary about Oprah is that she has done so much and yet she is still a little girl. She is still very pure and you can make her cry and laugh so quickly." Upon accepting the award, Winfrey was expected to talk about her career, but instead used the majority of her time to praise another honoree, Jaycee Dugard, who was abducted when she was 11 years old and held in captivity for 18 years by Phillip and Nancy Garrido. She was raped and gave birth to two children before she was eventually rescued. Her captors were convicted. "I wanted to have the opportunity to meet her and to tell her how much her story and her life meant to me," she explained. "I said to Diane, 'I know Diane Sawyer should be the one to introduce her, but would you please let me do it.'" Winfrey went on to thank Sawyer, who was also in attendance, and praised the television special she did with Dugard. "Jaycee Dugard, I am so proud of you, your courage, your ability to press onward toward the future and toward a more victorious life for yourself and for using your courage your strength and your power to show the world that you care," Winfrey said. Following Winfrey's introduction, Dugard took to the stage, getting emotional as she thanked her mother for never giving up hope of finding her. She also spoke about her JAYC Foundation, which aims to give support to families dealing with abduction and other tragedies. "My hope is to be remembered for what I do and not for what happened to me," Dugard told the audience. Earlier in the evening, presenter Jessica Alba showed off an acorn necklace she was given by Dugard. The necklace represents Dugard's charity. 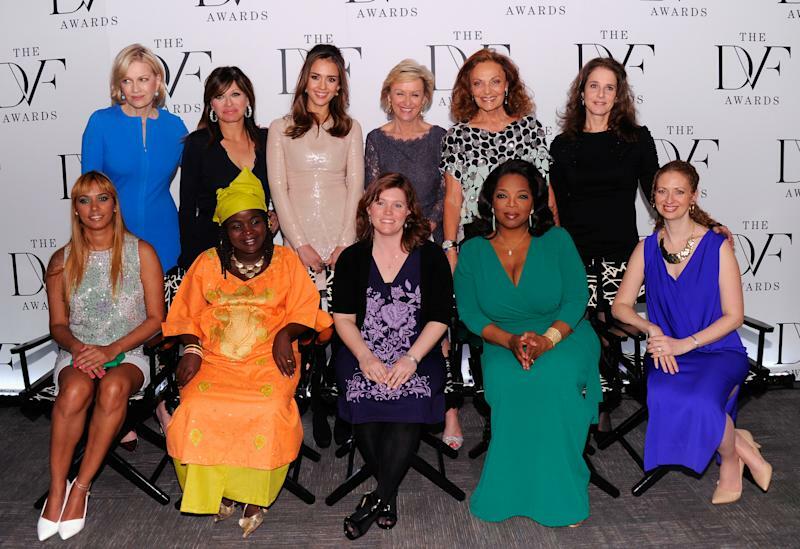 The DVF awards honor women who are courageous and fight for justice. Artist Panmela Castro, who battles against domestic violence; Chouchou Namegabe, who fights for women's issues in her native Congo; and Layli Miller-Muro who founded the Tahirih Justice Center, which protects women from human rights abuses, were also honored. Each honoree receives a $50,000 award from the foundation. The awards were part of the festivities surrounding the Women In the World conference.